If you like the Air Jordan X, then this is a must have……just because of the number 45 on the side. It looks like sneakerheads might have to wait because they might not release until March 2010. What do you think? Check out the newest Nike Lebron James sneaker. The Lebron VII has an interesting look but it is solid. It has Flywire technology and a white woven section. What do you think about these? It looks like the Transformers Packs were not enough for Nike that a G.I. Joe Pack will be releasing as well. This pair of sneakers is the Nike Zoom Sharkalaid. There will be two other G.I. Joe Packs being released as well. What do you think? I’m not too crazy about the sneaker but this colorway is pretty darn nice! These Nike Zoom Lebron’s will be around soon so look out for them! Check out the champ in Taiwan earlier this week. Kobe Bryant in on a tour with Nike in Asia and here are some pics from his stop in Taiwan. Lebron Gets Dunked On By Jordan Crawford – VIDEO Exposed! The video has finally been leaked! Lebron getting dunked on by Xavier’s Jordan Crawford brought to you exclusively by Step Up Ya Game! I love me some quickstrikes and this is just another reason. This Nike SB Blazer is a July Quickstrike and is crazy. The colorway is not too loud and looks amazing. Be on the look out for it! 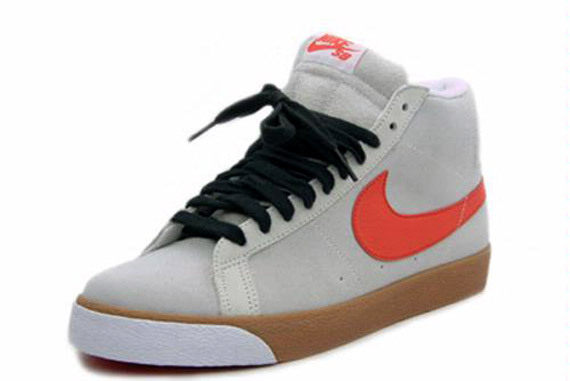 Yet another crazy design for the Nike Blazer High. This design has dubbed the sneaker the nickname “Godzilla.” The green section of the sneaker is a lizard skin pattern. These are hot and are set to release Fall 2009, but no confirmation yet. Check out another colorway for the infamous Air Jordan Retro 1. This par comes in a black/white/varsity maize colorway. It is expected to drop in September. What do you think?